Spacious tri-level lodge style home with lake views from every room! Private secluded neighborhood. Deeded Driftwood gated common lakefront at end of road with beach/dock/boat slips (subject to availability). Library with cathedral ceiling, great room, hardwood floors, 3 master bedrooms with ensuite baths. First floor has master suite, as does basement and 2nd floor, all with lake views, great for guests, in-laws. Finished walkout basement with cherry built in bar. 3 stone fireplaces. Huge deck spanning entire length of house features a lake view! Almost 5000 sq. 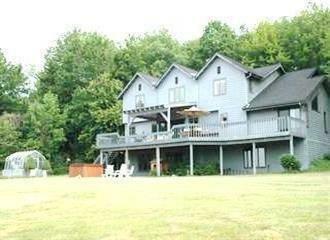 feet of living space in Bemus Point outskirts with over an acre of land! Maps & survey of home and dock at end of road are ATTACHED-please ask if you cannot open attachment. **No heating system-cannot be financed with a mortgage! Directions To Property: Route 430 West Towards Bemus Point, Turn North Onto Driftwood Rd.